I’m sharing a photo from the first meal on the new BBQ. I’m all for one grill meals. New potatoes, zukes and beautiful rib eye steaks. Hope you’re hungry now. 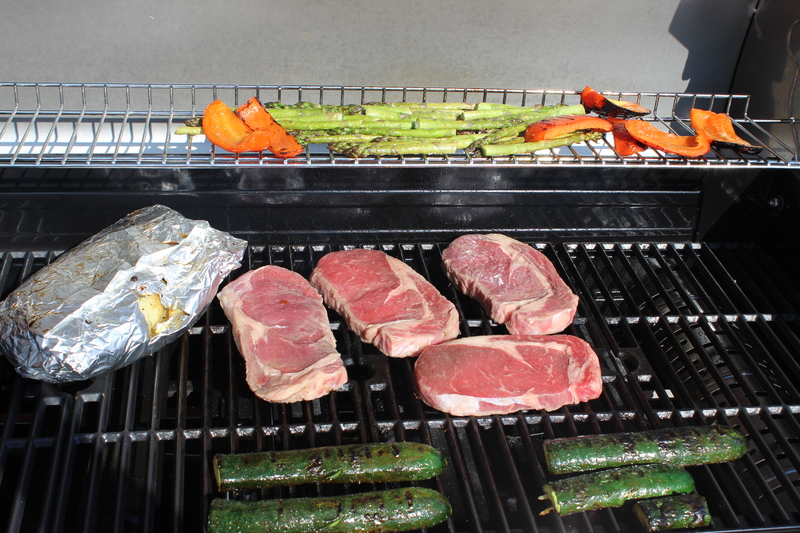 Categories: Parenting | Tags: balanced diet, BBQ, cooking, food, grilled veggies, grilling, steak, yummy | Permalink. …shall be condemned to repeat the past. You may be wondering about how things went while I was away. Well, there is an old military saying that the best laid plans will not survive first contact with the enemy. My problem seems to be that I can’t predict which enemy I need to plan to defeat. The lunch planning seems to have worked. Both kids and my wife appear nourished and hydrated. The things I made for them prior to departure were all used. One battle won. The texts from wife wife throughout day one did not indicate any sort of challenges although there was an email from Milo’s modeling agency that came through and required photos and his resume be printed out. Bed times and wake ups did not seem to pose any problems. Kids made it to music lessons OK. Dinner was pre-made and left for everyone. Did you see any landmines yet? I didn’t. I didn’t until the phone rang during dinner that night. RING. RING. RING. I look down at the phone and see my own name looking back at me. A shiver passes through me like I am feeling someone walk over my grave. “Hmmm.” I mutter, “This can’t be good.” My friend graciously picks up his beer and looks towards the TVs. Wife: I’m trying to find Milo’s resume on the computer. Where the hell is it? Wife: I’ve looked at a bunch and there all wrong. Wife: I see all of these old copies and there is none of the updated info in any of them. What the hell did you do last time? Me: (start talking and after about 45 seconds realize that the cold silence at the end of the phone line is not just from her) Oh my God. My phone died. My buddy starts to chuckle and hands me his phone. Me: Hi, my phone died. I am so sorry. Milo: Hi dad. What are you doing? Me: I’m trying to get a hold of your mother. Can I speak with her? Milo: Hang on. (muffled words) Um… no. Me: What do you mean, No? Milo: (getting upset) She’s typing on the computer and she’s really mad. Mommy. PLEASE talk to Daddy. She won’t do it. Me: Ok. Don’t worry. Tell her I’ll call her later. Love you. Bye. Fast forward to later that evening. Having plugged my Blackberry in and assured myself that I can’t pull the cord out or anything, I attempted another call. It seems that Milo got off the phone with me and ran downstairs to the kitchen. He engaged in potentially life saving behaviour by taking the bottle of Schnapps from the freezer and pouring some into the biggest glass he could find. He carefully approached his mother, set the glass beside her and fled. My wife had mellowed to the point that we could smile and talk. Oh, alcohol. For every time you get me in trouble, you solve a problem for me. Thank you. Thank you again. Here is how the evening went for her. She got home from work and began discussing dinner with the kids. They stood in a circle in the kitchen looking down at the pre-made dinner I’d left them disdainfully like Gods unhappy with the burnt offerings of mortals. Unable to smite me, they chose to strike out on their own and have Kraft Mac and Cheese with a salad. The pot is set to boil and the salad is made. Hmm. The water in the pot appears to still be cold. Hey! No flame from the burner. Oh, yeah. Daddy said to turn it to lite. BOOOOOOM. The children fling themselves to the ground. The cats scatter. Geese in the pond over by the golf course take flight. Mommy is unfazed. She knew that would happen. Dinner gets made and the traumatized children eat every bite. Nothing is left. Music bags are packed and the trip to music class is unusually silent. On the way back, the kids begin to make congratulatory comments that although well meant will eventually piss their mother off. Things like, “Oh, mom. You stopped the car for the stop light. Great work.” and “Wow mom, we didn’t think you knew where music class was. Hat’s off for finding it.” Arriving home, my wife heads to the office and plans to quickly and effortlessly print out a single page of paper and one photo. My wife has a love-hate relationship with technology. Mostly hate, actually. There are times when I think that technology hates her back. So as she begins to search through My Documents and realizes that she has no idea what the file is named. And there may be some small, well… tiny or perhaps minuscule element of responsibility on my part since I have a totally random naming convention for files. It was at this point that she discovered 8 or maybe 10 versions of Milo’s resume, each different and apparently none complete. She began to see the quick print job dissolving into a full editing job and called me. Regrettably, I can’t remember where or what I named the last resume and may not have actually remembered to save it and to top it all off, I appeared to hang up on her. Not so good for her temper or my future happiness. Oh, did I mention that one of the 9 ink cartridges is almost empty and makes printing the picture a seat of the pants, nerve shattering experience. Well, that is a glimpse of the first day. The others got better and I made it home with gifts. Not such a bad idea, I think. Categories: humour, Parenting, travel, work | Tags: again, business travel, computers, cooking, explosions, frustration, gas stove, kids, macaroni and cheese, modeling, photos, printers, resume, wife | Permalink. Of Course I Needed a Cleaver! I’ve had something of a knife fetish since I was quite young. 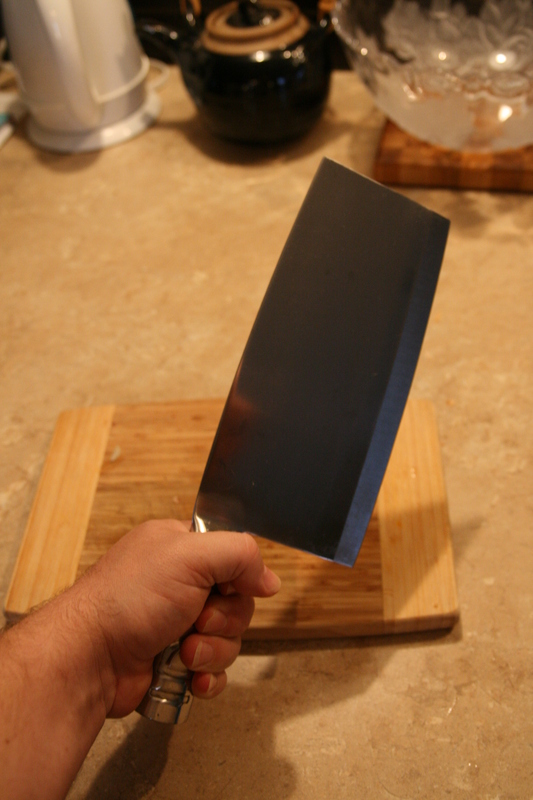 In fact, my mom reminds me that I always used the biggest knife I could, regardless of the task. Cut you a piece of cheese? Sure, let me get the 8″ cook. Yes, I do know there are no bones in Cheddar. Please! When I went to pick up the kids from my parent’s place after their week of vacation, I took all of my kitchen knives along with me. They were in need of a good sharpening and I can only trust my dad to do it right. I’ve since had to re-learn good knife handling techniques due to several near misses… of the bone that is. He did warn me that they were very sharp. I’ve had to ban Milo from casual knife use until I can get his technique up to par. After all, he can hardly text me for help with only 6 fingers left. Just before I left, indeed as I was packing the car, Dad wandered over and asked if I had any use for a cleaver. He’d bought it for my mom who apparently laughed in his face. Now, Dad knows me pretty well so he dropped it into the bag I was holding before I even needed to say yes. Oh Yeah!! And my wife was at home and didn’t have a chance to editorialize. Double Yeah!! So the cleaver went home. More famous than my knife fetish is my legendary lack of short term memory. Despite all of my excitement, by the time I got home the cleaver was a forgotten relic of the past. Until my wife was helping Maya unpack. When Maya drew forth the cleaver from the bag full of Barbies and started to swing it around, well… that part was more exciting than when I got the cleaver. It seems that there were certain rules regarding the transportation of dangerous goods that I neglected. Cheerfully, there wasn’t any associated lopping of limbs. Her’s or mine. Now the cleaver lives safely in my kitchen. It is something else. Nothing seems to stain or mark its surface. It’s forged from a single piece of metal. And oh the cleaving it can do! Why I’ve cleaved chicken breasts, beets, carrots and garlic. Not one of them interrupted the swing of my mighty cleaver. Nothing stands in its way. I’m told it was made in China,but the arcane runes etched on the blade that don’t look Chinese to me. Perhaps Elvish or Goblin. I’m just certain that if I ever decipher them I will learn the true name of this magnificent instrument and unleash unheard of powers of cleaving. Powers of evil beware. Then again, I may chop off my own hand and curse the damn thing forever. But until then, I can live the fantasy. Categories: humour, modern living, Parenting | Tags: cleaver, cooking, fun, kids, kids and knives, kitchen, knives, sharp, sharpening | Permalink. As usual on Sunday mornings, Maya and I went shopping for groceries while the rest of the house slept. An hour of father-daughter time spent picking out firm potatoes, the perfect strawberries, finding the freshest thyme and basil so that we don’t need to resort to eating boiled noodles and canned pasta sauce is time well spent. I’d bought some croissants the day before and figured that making them into French toast and adding fresh strawberries and whipped cream might make for a nice Sunday brunch. A quick stop at Starbucks ensures that the under-caffeinated won’t rise up and revolt at the extra time needed for a decadent meal. A culinary delight is born. The results: one plate eaten, one plate with 2 bites from 1/2 a croissant – no strawberries left and a bowl with the whipped cream eaten and all of the strawberries abandoned. Why do I bother? One won’t eat toast, the other will only eat rye toast. One won’t drink apple juice, the other demands Coke. But assuredly, no one wants whatever I’ve slaved over. After swimming yesterday, Maya and I were waiting to pick up Milo. We were sitting in a little Italian cafe and she asked me for a muffin. “What kind of muffin do you want?” “Do they have banana?” she pondered. “Yes, both with chocolate chips and just plain.” “I like plain banana muffins” I went and got in line, ended up buying dessert for dinner in addition to the plain banana muffin. As we met up with Milo, Maya asks, “What kind of muffin did you get me?” “Plain banana.” I reply. She starts to cry. “I just wanted to know if they had them,” comes the tearful reply, “I wanted blueberry!” Why do I bother? Categories: humour, modern living, Parenting | Tags: cooking, effort, food, frustration, meals, Starbucks, waste | Permalink.